Home » Kadhambam Corner » How to Apply New Smart Card-Ration Card Online using Tnpds website? Procedure for Apply New Smart Card-Ration Card Online using Tnpds website is described in the below article. Watch the video for Tamil description and subscribe us. Tamil Nadu government announced that general public can apply for the new Smart Card online, if they did not applied through the nearest distribution centre. Click on “Smart Card Application” under the Useful links section in the right side of the Home Page. After clicking on this link, an application form similar to below will open on the next page, fill all the necessary details in to it. Add a recent photograph which should be less than 2 Mb. View the video for the details to know about How to Add/change the photo once it is submitted is described click here. After filling all the required details in the smart card application form, upload the residence proof in form of JPG, PNG or GIF format. The size of file should be no more than 2 MB. Please remember to provide supporting document proof where ever it’s required. After completing all the details, click on the “Submit” button at the bottom. After submitting the application, you will be provided a reference number which will help you track the status of your application. If you have already applied for the smart card, you must have your reference number. Using that reference number can check the status of your smart card application by visiting the homepage of the website at tnpds.gov.in and clicking the “New Card Application Status” link in the right column. You may be also interested in How to Add/Change photo-Smart Card/Ration Card Online using Tnpds website? Hi, i did not understand your question. what do you mean by action? After clicking confirm button, i am getting error as “Internal error Please try again”. I tried night time (9.30 PM) is there any timing for submission ? any idea ? Since it is internal error, the error from server side.you can try in the morning after 9:00 AM. I submitted all the details but ehen i click on confirmation button i am getting sn error as file size should be leess than 2mb.. how to rectify it? The beneficiary picture file size too long, must be in 2mb. I am getting the above error. I have checked the picture and files uploaded within the required size. But at the last stage when submitting it is telling the same error. Which picture i should resize ? You mean the head of member photo ? If it is so, i have captured my photo directly through online cam. I went to this site and converted my photo to passport size or stamp size. Then edited the final photo and resized to 122×136 pixels and size is 4kb. Previously i uploaded a photo 60×60 pixels of size – 8kb. Sorry for my late reply..if you give your husband name as a family head(even if he is in abroad) it will be better.but there is nothing wrong in it by giving your name. i think if you want to change the family head name still you can change. Gas connection address and the address to be mentioned in smart card has to be same? I have my gas connection address in different area. sorry for my late reply. you can give your new address and submit your new address document as an evidence. Sir, I have submitted my application for new smart card. Please let me know the duration for processing and issuing new smart card. Hi, Is the smart card being printed? I still get the message that your card is not yet printed message, when i click the concerned link in the left . It is the same message, that i get after submitting on online and also given a passport size copy of my photo with xerox of old ration card at the respective office. Do you have any update on the information on it. When i can expect the new smart card? After my new smart card application, i got a final status- “Card issued” collect it from local Taluk office. When i went there the person replied differently “Your card status is in issuing” come after 1 week. I think the fellow tried to get bribe or just the regular government employee tactics to make the people grief and pay some money. Stupid people still like this. How can i check the status of application. When i cotact helpline somebody told the phone number not registered. What is the remedy. Hi, I applied new smartcard, but after confirm, I found error was My family aadhar card was associate with another family memeber. Hi I had applied for a new smart card and got the reference no also. I am continuously. Checking the status but it s showing its under document validationm. What is the next step that I have to do. Its nearly one month after applying. Kindly tell what I have to do. I filed the online application for a fresh smart card. The reference number has emanated but befre I could note down the number the power has gone. So I could not find out the reference number. When I went to see the status of the application, I need to put the reference number. Kindly tell me how to know the reference number now? Hi , I’ve applied new ration card contain my name only (as family head) . and my wife name not added in application due to Adhar under process. kindly suggest the above application can get process or any chance to reject. H, My old ration card has been canceled in 2012. Can i apply for the new smart card online? I have applied for new smart card online on 11/11/2017. Still the application status is “application accepted and awaiting for document verification”. How long the process would take for me to get a new card? Please wait. usually it takes even two months to update. Ohhh. Thank you for your support sir. I wait. Good response. You are welcome sir. Subscribe to our website and YouTube and supports us sir. If you found any useful posts you can share with your friends also. Sill now the application status is aavana saripaarppu….2 months passed.when it will be approve….and also my wife,child name not added in application due to name cancellation in her parents card and awaiting my child birth certificate.kindly suggest the above application can get process or any chance to reject. it is common. it will take some time more than 2 months. for other quires Pls contact the Online support or file a complaint or goto nearest Eseva center. I have applied for new smart card on July 15, 2017. But, still the status is showing as “Document verification.” 6 months passed. when will it approve. Pls contact the Online support or file a complaint or goto nearest Eseva center. What is the link for Online support. I contacted them through the chatting option. They said to wait for some days. I don’t how long to wait. Already seven months gone. Anyone else have the same problem? two months is maximum limit but 7 months is really too much. go to your nearest eseva center and ask them about your status. I have applied for new Smart card and attached Gas book front page as address proof, does this will be acceptable ?? If NOT how do I edit application and what document to be applied as address proof. some time they will consider EB Bill Address and gas connection as a address prof.since you have applied, pls wait for their reply.if they reject your application then apply new smart card with your Aadhar card or Passport or Bank passbook as a Address proof. My old card expired and I went to the fair price shop and they told me to go to Mylapore office, i went there & after checking they told me old card is already cancelled and I have to apply for new card. If I apply for a new card how long it will take to get the smart card. When applying can I say card renewal instead of new card? pls advise me. kindly visit the e-seva center to apply for your new ration card.They will guide you. I got married recently. 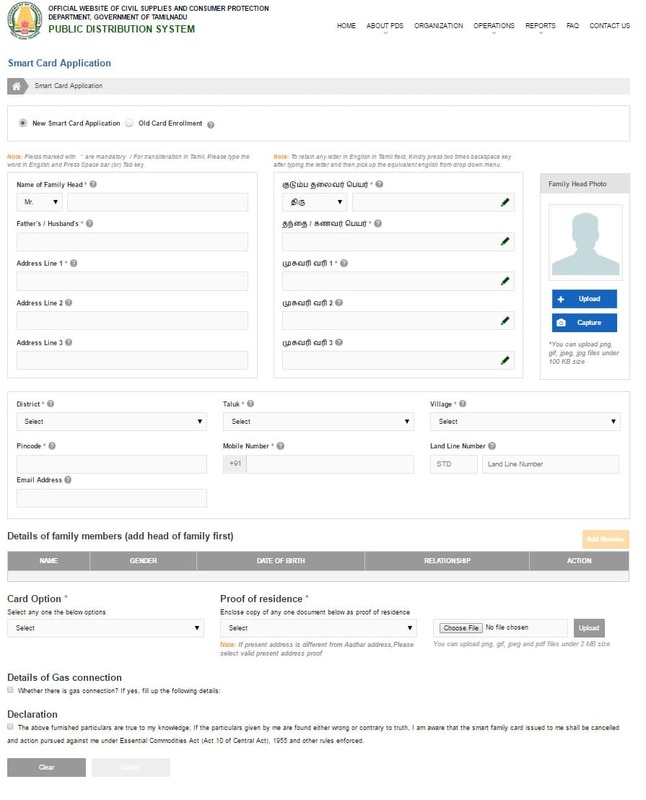 So myself and my husband wants to remove our name from our parents ration card and apply for a smart card with my name and my husband as family head (2 members). How to delete member from Manual Ration Card? Hi, Recently Married, the house is in the name of my Parents.I’m trying to apply for a smart card,Should the Address Proof (Gas bill,EB Bill) Should be on my Name or What?? your name should be removed from your parent smart card. you should have a valid address proof on your name(aadhaar, passport, Bank passbook, etc.,) to apply for new smart card. What is the Field Verification and still how many i need to wait for my card. thanks for your inquiry. field verification will be done by taluck office. Since you know about our government work. they will take even one month to complete. kindly wait.. I had applied for ration card through online. Now the status says “Your New Smart Card Application has been Verified and Approved Successfully and Processing for Card Printing”, The status is same for more than two weeks. I don’t know what next. Weather Card will be sent to my residence address, or should I go to ration shop and collect. Would any one please let me know the procedure. I have applied for new card on Jan 2018, and still my status is in Document verification. They told by the end of 3rd month after applying, we will get the new smart card,but its nearly 3 months still the status is in Document Verification. dont worry sir. you know about our government work. it will take little more time. I have entered gender as “Male” instead “Female” and submitted the application. Is there any option to correct the mistake before proceeding further. go to the nearest e-seva center and ask them to correct it. we applied the new smart card in three times but rejected by taluk officer due to aathar card address is change.what can I Do? Update the correct address in Aadhar and re apply again. and Processing for Card Printing”. My card status is “Inactive”. Letme know why it is “Inactive” status and when i will receive my smart card. 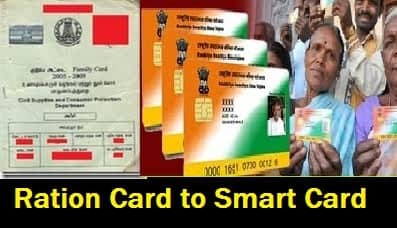 i think once you received the card and used it in ration machine then the inactive will became active.You have to wait for receiving the Smart card. marriage certificate is the document to remove the names. if your father in law card has only one family member then your removal will be rejected. What is the monthly salary range to mention in the application, is there any condition card may be accepted / rejected based on annual income. mention your salary as per your income certificate.no they will not reject depending upon salary range.